The infra-red images above highlight dark marks on the interior surface of trough 473.1932. The darks areas appear to be scorch marks, suggesting that this vessel may have been used for hot stone cooking. In this technique stones heated in a nearby fire are added to a liquid within the vessel. The stones are continually retrieved, reheated, and returned to the liquid until it reaches the desired temperature. A small sample of wood was collected from trough 473.1931. A small amount of the sample was cut into thin slices known as 'sections', and these were mounted for examination using a scanning electron microscope (SEM). The scanning electron microscope allows us to resolve microscopic features in the wood that can help identify the particular species of tree that the spade was made from. Unfortunately the wood sample collected from this object was badly deteriorated. The images above, showing the wood in cross-section do not indicate the tree species from which the object was made. 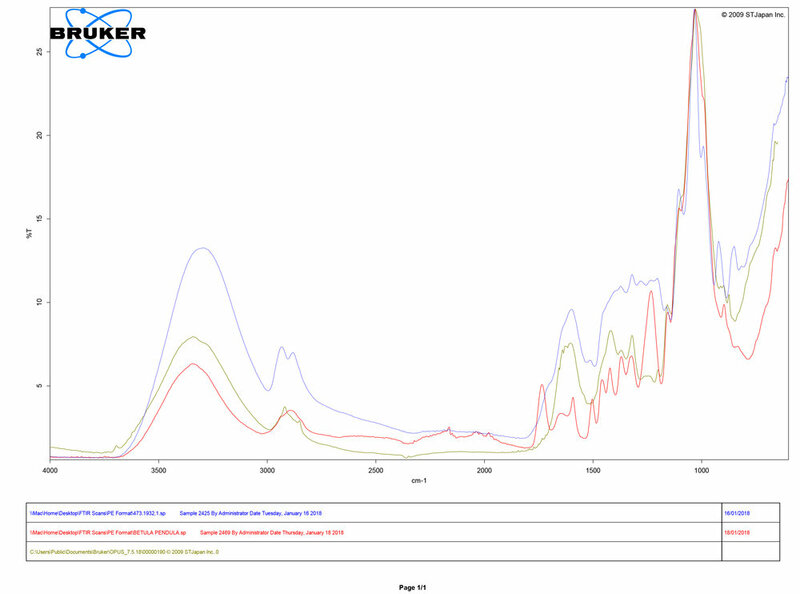 FTIR spectral analysis showing comparison of sample collected from trough 473.1932 (blue), a reference sample for Birch (Betula pendula) (red), and a reference sample for Papyrus (green). The sample of wood collected from trough 473.1932 was analysed using Fourier Transform Infrared Spectroscopy (FTIR). The spectral analysis above compares the sample from trough 473.1932 with a reference sample for European Birch wood (Betula pendula), and a reference sample for natural gypsum.